Joseph Ramirez won Kentucky’s first medal of the 2018 USA Games with a gold in the 100-meter dash. Team Kentucky returned from the 2018 Special Olympics USA Games on Saturday, July 7, carrying a record number of medals with them home from Seattle. Team Kentucky grabbed 50 medals at the Games, including 20 gold medals. The total medal count topped the 42 medals Kentucky won at the inaugural USA Games in Ames, Iowa, in 2006. It was largely athletes making their first appearance at the USA Games who led the way for Team Kentucky, winning a whopping 30 of the 50 medals, including 16 gold medals. Every Kentucky athlete got into the act, winning at least one individual or team medal. Just as it did in the 2006 Games when Matt Minning of Taylor Mill won the first gold medal ever presented at a Special Olympics USA Games, the Kentucky gold rush got started right away. 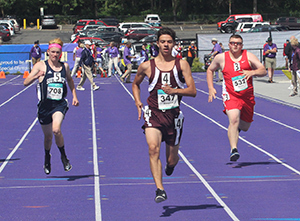 Joseph Ramirez of Murray – the second youngest athlete on Team Kentucky won his heat of the 100-meter dash – one of the first events at the Games – by .12 seconds over Samuel Howell of South Dakota. It was the first of two gold medals for Ramirez, who also dominated his heat of the 200-meter dash to claim gold. Fellow first-time track athletes Kate Nason and Caitlin Roy also got in on the medal fun. Nason won silver in the 3,000-meter run on the second day of the Games and followed two days later with another silver medal in the 1,500-meters. Roy delivered two incredible performances – a silver medal in the 100-meters followed gold in the 200-meters – and both times, Roy ran the second fastest time overall for women in the event. In the 100-meters, she finished .66 seconds behind Rebecca St. Remy of Florida. In the 200, Roy was just over a second slower than St. Remy, but the two were in different heats. Not to be outdone, Ryan Barts of Georgetown won a pair of track and field medals in his second trip to the USA Games. He earned his first ever USA gold medal in the 100-meters after winning a bronze and a silver medal at the 2010 Games in Lincoln, Neb. He also brought home a bronze in the long jump and placed fourth in his heat of the 400-meter dash. Bowlers Daniel Williams and Joseph Jarrell took gold in the doubles event. Two Kentucky bowlers also grabbed gold medals on the first day of competition. Michelle Barnes of Milton and Kelly Kunisch of Elizabethtown each won their divisions of the singles competition. Barnes rolled a 290 series for her win. Kunisch bowled a 274. Joseph Jarrell of Olive Hill and Daniel Williams of Glasgow placed fourth and fifth, respectively, in their singles divisions, but doubles the next day is where they would really shine. The pair bowled a 637 combined series to take home their own gold medals in their doubles division. Barnes and Kunisch partnered to roll a 571 and win the bronze medal in their division. On the final bowling day, the four Kentucky bowlers teamed up to roll a 1,131 and place fourth. All four Kentucky bowlers were competing at the USA Games for the first time. Not surprisingly, Kentucky gymnasts made the biggest impact on the Kentucky medal numbers. Five Kentucky gymnasts competed at the Games, the most in the program’s history. The group was profiled during the ESPN coverage of the USA Games. And even with USA Games veterans Danielle Blakeney of Erlanger and Lee Dockins of Russellville on the roster, it was USA Games newcomers who had the biggest impact there as well. Ludlow’s Jennifer Rhein earned four gold and one silver medal in her first USA Games appearance. Rhein dominated the all-around competition where she posted the highest overall score of any gymnast at any level at the meet. Her only silver medal came in the vault where she still scored an 18.93. Tonya Cornett of Lexington also won four golds and a silver in her USA Games debut. Cornett also claimed all-around gold winning her division by nearly 10 points. Her only silver medal came in the uneven bars. Fellow USA Games rookie Aliya White of Lexington, who was the youngest Kentucky athlete at the Games, won silver in the all-around with a score of 72.10. Her gold medal came in the balance beam, where she posted a score of 18.58. She added a silver medal in the uneven bars and a bronze in the floor exercise as well as a fourth place in the vault. Jennifer Rhein (right) won five medals, including four gold, in her first trip to the USA Games. Blakeney and Dockins also had very successful meets. 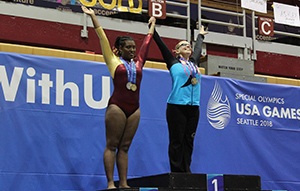 Dockins claimed the all-around gold medal that had eluded her at the 2006 and 2014 USA Games. She also won gold in the floor exercise and bars and won silver medals in beam and vault. Blakeney was competing in Level 3 gymnastics for the first time at a USA Games. She earned the bronze medal in the all-around competition to go with a silver medal on the bars, fourth place finishes on the beam and floor and a sixth in the vault. The Kentucky swimming delegation featured four first-time USA Games participants alongside 2010 USA Games veteran Megan McCormick. 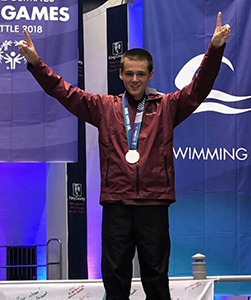 Justin Hale of Louisville – Team Kentucky’s second-youngest athlete – claimed Kentucky’s lone swimming gold medal with a win in the 100-meter freestyle. He added a silver in his final race of the Games, the 50-meter backstroke. Hale also had a seventh-place finish in the 50-meter freestyle. In that same backstroke race, Hunter Eudy of Independence reached out to claim the bronze medal by just .02 seconds. It was his first individual medal of the event to go with fifth-place finishes in the 100-meter freestyle and the 50-meter freestyle. Drew Janoski of Lexington grabbed two individual medals – bronze in both the 50-meter freestyle and 50-meter backstroke to go with a fourth-place finish in the 25-meter backstroke. Cassie Wright of Louisville won a silver medal in the 100-meter individual medley to go with a fourth-place finish in the 100-meter freestyle and a fifth in the 200-meter free. McCormick won silver in both the 100-meter freestyle and 100-meter butterfly along with a fifth-place in the 10-meter individual medley. Eudy, Hale, McCormick and Wright teamed up to claim an additional bronze medal in the 4×50-meter medley relay. Justin Hale won Kentucky’s only swimming gold medal. The Unified golf pair of Wake Mullins and Unified partner Dennis Gaines grabbed a bronze medal in the top flight of the 18-hole alternate shot competition. They also became celebrities at their first USA Games. Their big moment came in Round 2, when Gaines turned to Mullins on the tee of the par 3 seventh hole and asked, “what should I do here.” Mullins told him to “hit it in the hole,” so he did, carding his first hole in one in 41 years of playing the game. The feat got them on stage to talk with ESPN’s Kenny Mayne during the Closing Ceremonies and interviewed on a golf podcast covering the Games. Jude Zilliox of Alexandria, who had the honor of carrying in the Kentucky sign during the Opening Ceremonies, grabbed a silver medal in his flight of the 9-hole individual stroke play event. It was his second USA Games medal after winning bronze in the Unified competition at the 2006 Games in Ames, Iowa. Every Kentucky bocce athlete claimed at least one medal, including one of historical significance. 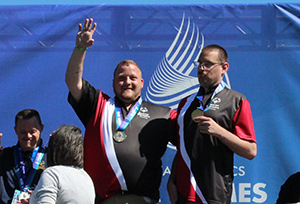 Brett Thompson and his dad and Unified partner Jeff claimed the first Unified bocce USA Games medal in Kentucky history on July 4. The team went into the medal match undefeated and fought hard for the gold before eventually falling 7-8 in sudden death. Brett placed fourth in his division of the singles event. Kathleen Crumbo of New Albany, Ind., but who plays out of the St. Mary’s program in Louisville, also placed fourth in her division of the singles competition after reaching the bronze medal match with a 12-0 win in her second match. Crumbo then teamed with Cindy Cusick of Louisville to win silver in the doubles event. Cusick – the only USA Games bocce delegation member with previous USA Games experience – also took silver in the singles event. Cusick now has four USA Games medals, having won a gold and a bronze in bowling at the 2006 Games. At those Games she received her sixth-place singles ribbon from Special Olympics founder Eunice Kennedy Shriver. 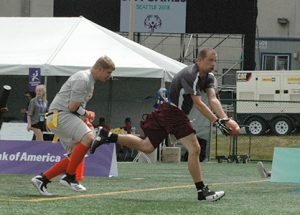 James Jordan helped lead the flag football team to a 5-1 record and bronze medal. Both Kentucky team sports entries – basketball and flag football – had similar experiences at the Games. Both dominated their pool play divisions, going undefeated in their early games. Both were bumped up in divisioning for the medal round. Both put up a great fight in the first medal round game before eventually falling and both came back to claim the bronze medal with convincing wins. The flag football team out of Bowling Green finished the tournament 5-1 with a team made up entirely of first-time USA Games competitors. The basketball team out of Owensboro finished 4-1 with a team that included two veterans of the 2006 Games and one from 2010. The 2022 Special Olympics USA Games are already on the calendar. They will be held June 5-10 at the ESPN Wide World of Sports Complex at Walt Disney World in Orlando, Fla. Team Kentucky for the Games will be announced sometime in 2021. For information about Team Kentucky or the USA Games, contact Senior Program Director of Field and Athlete Services Kim Satterwhite at 502-695-8222 or ksatterwhite@soky.org.